The Cherokee Chief is one of seven concept vehicles Jeep showcased earlier this year at the Moab Easter Jeep Safari in Moab, Utah, arguably the for Jeeps and some of the toughest off-roading in the United States. The Chief concept – inspired from Jeep’s own 1970s model with the same name – boasts a 3.6-liter Pentastar V6 and a six-speed manual transmission, housed on a frame and running gear of a four-door Jeep Wrangler Unlimited JK. 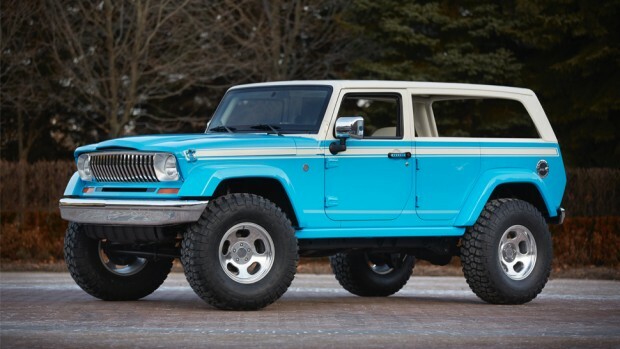 With a Surf City blue and white paint job and wood-lined interior/headliner, the Chief turns heads and we can imagine churn out more than a few rough trails underneath the Dana 44’s and 35” wheels. The automaker typically brings out a few concepts each year in Moab, though the Cherokee Chief is one we hope rolls off the assembly line, right onto the trail – or the beach.